The following article is not meant to have any proper structure. 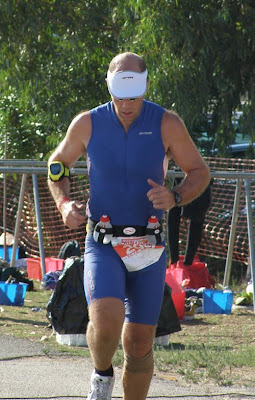 I am just writing some random thoughts from my experiences into triathlon, since I started it about a year ago (i.e. summer of 2010). I only aim to share with all you some aspects, which I think these might be of interest for anyone involved into this sport. p.s: I am actually not considering accurate syntax writing at first place. I write down ideas as they flow out of my head in an attempt to catch the instant inspiration before they go away. I am reviewing the text from time to time to spot any obvious mistakes! Triathlon: an equation which includes an endless number of variables. It can be viewed as a sport, but the more you look into it the more you realise that it demands gradually more and more of your resources (time, money, physical and mental). Even, if you want to compete at a basic level, the sport of triathlon requires plenty of components to work together: Swimming asks for technical ability, regardless of how strong you are. You will have to spend months and months training on the water only to realise that you can become a little bit faster. Cycling needs endless hours of training on the pedals and the bike itself needs to become part of your body, too. Running is more accessible to the public (easy to find a place and run), but it's the last section in triathlon and you will have to cope with the tiredness that accumulated from swimming and cycling . Hence, in between other aspects, the risk of injury increases dramatically if you are not quite familiar with the multi-sport challenge or if you are not used starting an activity already tired. Don't forget to add the need to handle the transitions (also called T1 and T2). To put it in another way: On average for every minute that you 'waste' during a triathlon race, you drop down on the ranking by about 6-8 positions! (that's almost correct for an event of around 200 people in sprint triathlon and about 2-3 positions for Olympic Distance triathlon). So, if you want to save in your overall time you can imagine how critical is to consider a range of several issues (even elastic shoe laces, etc!). But that's not only it: You will have to plan how to balance and mix your time between the 3 disciplines. You can't just practice one of them and shift to the next one thinking that you can leave it after excelling at it. You will constantly need to train in ALL of them and as best as possible in the right way, i.e. share the time efficiently between them. Additional aspects include mastering the technique, mentioned before, the tactics i.e. they way you save energy consumption and effort during the race, etc. But that's only the beginning: You will also have to consider that fish-n-chips or cheeseburgers will not move you forward at all. Training without proper nutrition simply means that training goes in the bin! Especially, in endurance sports such as triathlon, there is no way you can perform well (unless you dope yourself, but even then this is does not give guarantees) without fuelling up your body with healthy substances including vitamins, carbohydrates, protein, etc, plus managing hydration. And of course you will have to learn how to manage nutrition during a race, too! Yet, there are more ingredients to be added on the triathlon recipe: Self-coaching! Who is going to comment on your performance or spot any of your weakness? A coach can complement your thoughts sometimes. You might be doing something wrong only to find out at a very later stage about it. An external observer (many thanks to my girlfriend!) can help you save time and perhaps reduce the possibility of an injury. Say, you got your physical training right, you follow the best nutrition plan ever, you got a coach... There is still more which you will have to practice equally carefully: Mental toughness. Triathlon will make you to suffer. A lot. More than you can imagine. If you want to perform above average, you will have to negotiate tough mental games within your head. Your mind and your body will be screaming the harder you train. If you don't have a solid mental spirit to resist (or perhaps adapt to) the pressure, then everything else around it (training, nutrition, exercise, etc.) will be spoiled. In my opinion you can be physically well trained, but without mental strength you won't let your body deliver its best. A super expensive car (the body) can't be fast if the driver (the brain) does not know how to handle the power and acceleration of the engine. The obvious is that a solid dedication and commitment is needed if you wish to build up a rising progress curve. You can't just train one week and then sit down and eat pizzas the other week. You will have to plan the way you train (base, build, peak period, etc.) both indoors (e.g. on the gym) and outdoors. Add a full time job on top of everything mentioned above and there is almost nothing else left for other social or personal activities!! I am not sure if this will work in the long term, but I have so far discovered some benefits in trying to distribute my load like this: Saturday and Sunday is the time for cycling and, applying occasionally brick sessions by combining running (at recovery pace). On mid-week, 2 swimming sessions and 2 running sessions are considered, with one session each day. One day is left for rest (normally Wednesday). I think swimming sessions fit best on Monday or Friday, after and before weekend's hard training respectively, since a different muscle group is used (lower vs. upper body muscles). The 2 running sessions and the swimming sessions might be alternated (e.g run-rest-swim-run or run-swim-run-rest) to optimise recovery. At most, I manage to get an hour or so, of training on each training session. On the weekends, this number increases up to 2.5 hours/session. That is enough, if you want to race on a Sprint Triathlon event, but it might not be sufficient for distances beyond this. At most, this amount of training volume will help you complete (and not compete!) an Olympic Distance. You could very conservatively try a Half IM event, but you are exposing yourself to a high risk of injury. Not good news. You might say (and I agree with this) that a weekly training volume of around 9 hours does not suffice to prepare you well for a triathlon race, except perhaps for a Sprint distance event. However, considering the additional load due to a full time job, personal and social activities, etc, then the margin is very tight. Furthermore, you need to consider that continuous training plan lasting 3 to 4 months may end up in over-training you, especially if you have no previous experience or no consideration on recovery issues. The latter is something that I learned right away when I started training for triathlon since a year ago. During that period, a series of minor, but annoying injuries (knee pain due to running, calf pain due to cycling, shoulder pain due to swimming), forced me to restructure completely my training approach. It's not bad to go through a back-off stage, as soon as you know what's happening and why you need to cool down a bit. Self-judgement can be beneficial when aiming to improve your performance. Technique is vital element in triathlon, as with all sports. Lack of proper technique can lead to injury, as this was the case with my knee pain due to inappropriate running style (issues with strike and foot landing) and shoe design - I had to get special shoes that correct my foot pronation (more on this on a later article in this blog). Another 'lesson' I learned, during my training sessions was that recovery is also very essential and sometimes compulsory too! Yes, indeed, but believe it or not this is something that athletes overlook, thinking that a non-stop effort into training will lift them to superior physical level. That's not so true anymore (see, bibliography on older post within this blog, e.g. 'The Complete Guide to Endurance Training'). Training stimulates body, nutrition helps to build body and recovery helps body to adapt to training load! No recovery or over-training = higher risk of injury = shifting backwards the training schedule. In practice, this means that it might be better sometimes to stay home and get a good time of sleep or relax, instead of digging deeper into a training session at an already exhausted body. Give your body time to adapt (and repair the micro-tears in damaged muscles, etc). Don't over do it though, i.e. don't rest for a week (unless if an injury forces you that way or if you have ended your season). I am not sure why the 3 triathlon events (swim, bike, run) were put in that order, but it is interesting to note that there is a progressive increase in gravitational force as you go from one discipline to the other. Swimming is the least gravity-dependent section, since you float on the water. Hands execute the forward moving action, while the rest of the body tries to minimise drag and assist hand's operation. As soon as you start the bike section, the action of the legs comes into play, with the upper body weight 'resting' on the aerobar (or handlebar) and the saddle. This means that the pedals receive power which is due to the force applied from the legs and the weight of the legs themselves. The transition from swimming into cycling affects energy expenditure required from the athlete, but since the upper body is supported on the bike then there is some redundancy. Let's move to the last section of the triathlon: The run. You abandon the bike stance and suddenly the whole body is standing upwards. All the body weight is transferred to the ground through the already exercised legs. Suddenly the lower body receives an increased shock. The gravity is punishing the tired muscle legs further and you perceive all your body weight as an 'extra' load from the bike to the run part. In my opinion the 2 main reasons that tire you most at the beginning of the run part are: (i) Legs are already tired from the repetitive action on the pedalling, (ii) Legs receive significantly additional pressure due to the whole body weight. I am not sure about this, but I believe that this is the main (not the only though) reason of why during the run part of the triathlon tall and heavy weight body shapes have a disadvantage over shorter and lighter ones. Clearly a 70 kg athlete and a 100 kg athlete, even at similar physical level (i.e. training in a similar way for the same length of time), can't have the same possibility for crossing the finish line together. I am talking about healthy weight, not weight which is owned to bad eating habits and lack of training, due to excessive body fat, etc. I've never managed to become less than 92 kg (I am 1.93 tall) and that was during a period about 10 years ago (while I was a student! ), when I was eating minimum amount of food and I was not training systematically (actually, I couldn't because I was feeling 'weak'). I am now close to 101 kg and my average weight before I started triathlon or rowing was around 98kg. Previously, I was only spending time for sports mainly during weekends while I was windsurfing (no gym, nothing else). Since I started triathlon, my weight went up! I exceeded 100 kg quickly and basically I think this was due to the muscle mass added on the legs from the cycling. Anyway, I just want to note in particular that my average weight is pretty above average and there isn't(?) much I can do to reduce it. For the curious, my body fat is currently around 21% (total weight 101 kg), still room for improvement, but this is down from 26% fat (total weight then was 108 kg) about 5 months ago. So, if you are an athlete on the region of 75 kg and you want to imagine what is to be 100 kg try this: Add a 25 kg jacket on your back and see how it feels! An additional 33% of body weight! It was written ['Racing Weight' Pete Fidgerlant] that an extra weight of 10 pounds (around 5 kg) requires an additional 6% of energy expenditure to retain the same speed. So, imagine what an additional load of 25 kg demands: an additional 30% of energy!. And there are even lighter athletes, in the region of 60-70 kg, who, for this reason, have even greater benefit during the run part. This is something I think I will never be able to deal with! - I don't mention this as an excuse, but it's vital for naturally big body shapes to realise that there is an 'upper' limit on how much you can fight against your normal body size. To put it in other words: You might never be able to achieve the same or even better running performance compared with a lighter and shorter trained athlete. So, don't waste your energy on this! You will inevitably have to apply a different strategy on your triathlon races to survive and stay close to the front of the race, if the issue of the 'body-shape' limit is what matters you! Clearly, a heavy-weight athlete can improve his run part if he trains properly, this is important to remember. But, from my personal experience, he/she is also more prone to running injuries. The lower part of the legs, knees, ankles, etc. receive about 3 times the body weight each time the foot lands on the ground. So, an instant weight of 300 kg per leg is what my legs are receiving each time I land on the ground during run (compare it e.g. with a 60kg athlete, which ~180kg which is significantly less). This requires some attention and it's the link between technique and running shoe selection and running injuries. 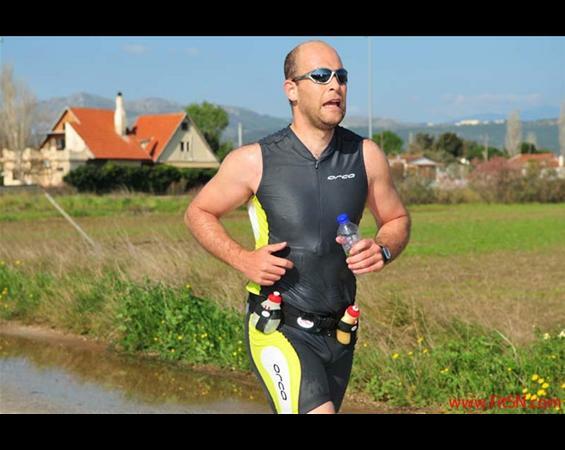 When I entered triathlon sport, minor, but annoying injuries, was my main concern. I was trying to figure out why and how these could be avoided and also how to correct them. During this search, I realised that body-weight can be a significant contributor to injuries, which is magnified when there is lack of technique. If you can improve technique you save a great deal of problems (and energy too!). But, if you can additionally optimise your body weight, then you can benefit more! So, in the recent months I have been concentrating both on technique and body weight management during my training sessions. I chopped around 6 kg of body fat in a time span of 4 months, without any diet (I simply changed my eating timing without sacrificing food quantity - more on this on later article on this blog). This is good news. I feel as if I rejected an unwanted load of 6 kg which was sticking on my body. I can now race the same distance by consuming less energy! And there is still room for more body-fat rejection, but the more body fat you want to eliminate the more it takes to achieve this (the law of diminishing returns!). It's vital to properly relate the physical capacity of your body and the current state of training with the individual disciplines of the triathlon. I mean, if you are a lean person, then you might perhaps excel in the run part, or alternatively if you have a strong swimming background then your technique is already in place and you can focus in the other disciplines to increase further your performance. This is something I have been working around for a long time now. As I have a tall and bulky muscular shape, then I understand that a light weight person can beat me in the run section. But, I also know that in the bike part (which requires strong legs) I can have an advantage, giving me the opportunity to gain time against all those who are better runners than me. You can use your strengths in the way described above to help you set up your race strategy. I haven't raced an adequate number of races to be able to provide an accurate and certain advice on this to the reader, but from the current experiences I can share with you my race plan as a heavy weight novice athlete which, so far, I believe it offers a good approach in a triathlon race. First of all, you need to practise your transitions. It's unacceptable to waste time during those time slots and try to cover this missing time in the sport section, e.g. try to run fast because your shoe laces made you to waste time! You have been investing effort into training for weeks and months to appear at the start line of a race and wasting race time this way is unfair! Put those T1 and T2 plans into place firstly. The swim part: Aim to stay close at least with the middle of the group, not far behind otherwise you will have to work hard later to catch up. I noticed that in my case, my swimming ranking is quite close with the overall ranking on average. Here's the explanation. I spent weeks trying to figure out how to balance my effort between the three sports during a race. I know that the run part is my weakness. Regardless of how tired I am, I can't improve my 5 km or 10 km sections. I've done the following experiment: I compared my 5 km running time within a sprint triathlon with the running time of an stand alone 5 km effort. I was surprised with my finding! Those two times were quite close! Around 2 minutes apart. I run the 5 km on a sprint triathlon in around 28 minutes, while this time is around 26 minutes (at best) when I run the 5 km on its own. So, during a triathlon race, if I need to gain some time, I need to drive my main effort into the bike part. This is my only chance to improve my overall time (swim+T1+bike+T2+run) and compensate the weakness in the run part. Indeed, the bike part fits my body shape quite well: It requires strong legs and being tall means that I can push down that pedal with an efficient stride. This explains why I can stay together with the top 25% of the athletes in the bike part. However, later in the closing section of the run part, most of those that I overpassed in the bike part are catching me again! How annoying this can be! Only if I could be a decent runner that would mean a better overall finish time. I don't have to be a fast runner, I only have to retain my position as it is at the end of the bike part, this can lift me up significantly! All the effort in the swim and bike part is fading out during the run part! It's mentally frustrating to realise this. But, I understand that I cannot keep up a fast running pace, I have never achieved a sub 25 minutes, while on the contrary all those fast runners are close to the sub 20 minutes time in a 5 km distance. So, that's where I left my racing strategy so far. I swim with rhythm, I bike hard and try to run steady to stay away from those who attempt to catch me again in the closing part of the run. This is what I am working right now. To be able to keep the running pace. I know that I cannot run as fast as those small and light weight athletes - but I want to be able to remain in front of them until the finish line as much as possible. You might say that my effort in the swim and bike part is burning out the run part, but I have thought of this possibility and fortunately this does not happen! I am still working on achieving a more efficient running technique. Another factor though, as described in this article 'Body shape and sporting potential' from the Times, UK online website, provides an insightful view into the importance of athlete's body. It explains clearly how important is to match your body shape with the sport you are into, if you want to maximise your performance. This article puts everything into an order! Personally, this article helps me to justify why I fit better in rowing instead of running too! So, knowing your natural limits can help you plan your training sessions: work hard on your strongest disciplines and try to minimise your weaknesses. It should be fun on top of everything: The Triathlon lifestyle! Ok, I agree that from time to time, triathlon, like any other sport in which you aim to reach and conquer a higher level, can leave you with frustration and tiredness. But this is normal, too. And it can happen to anyone regardless of his level. In such instances you can cross-train or have a recovery period or perhaps combine vocations with sports, too. Such alternative options are limited only by your ideas and your free time, otherwise there is normally a way to deal with motiving yourself. Moreover, triathlon provides a healthy and unique lifestyle from many aspects. You get the chance to travel around in races, train on a multi-variable terrain, meet and train with new people, combine, mix and train at 3 different disciplines, get a top physical condition, feel and be great! How many times have your friends been impressed with triathlon races: "...wow, you finished an Olympic Distance event..." or "...how can you race such a long distance?... ", these are some common quotes we've all heard perhaps. And we like to accept them!